The song Will Tura - Draai 797204 is professional recreation. It is not by the original artist. 17 dagen op zee Will Tura Your browser does not support the audio tag. Alleen gaan (My way) Will Tura Your browser does not support the audio tag. Als de zomer weer voorbij zal zijn Will Tura Your browser does not support the audio tag. Arrividerci Maria Will Tura Your browser does not support the audio tag. De mooiste Will Tura Your browser does not support the audio tag. De Mooiste Droom Will Tura Your browser does not support the audio tag. De vreugde van de winnaar Will Tura Your browser does not support the audio tag. De Zomer Boogie Woogie Will Tura Your browser does not support the audio tag. Disco Medley Will Tura Your browser does not support the audio tag. Doña Carmela Will Tura Your browser does not support the audio tag. 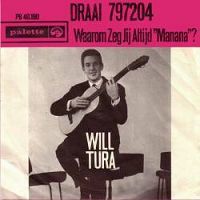 Draai 797204 Will Tura Your browser does not support the audio tag. Een hart van goud Will Tura Your browser does not support the audio tag. Een vrouw Will Tura Your browser does not support the audio tag. Eenzaam zonder jou Will Tura Your browser does not support the audio tag. El Bandido Will Tura Your browser does not support the audio tag. En huisje in Montmartre Will Tura Your browser does not support the audio tag. Geef al je zorgen maar aan mij Will Tura Your browser does not support the audio tag. Goodbye Elvis Will Tura Your browser does not support the audio tag. Hemelsblauw Will Tura Your browser does not support the audio tag. Hij is verliefd Will Tura Your browser does not support the audio tag.